Kaal Sarp Yoga or as they say Kaal Sarp Dosha. It is another one of the most feared yoga of Vedic Astrology. It is widespread information that person with this yoga lives a miserable life through out and gets defamed in society and like things and we can never be more away from the truth if we believe this. Before I start explaining this yoga, let's just look at the names of people who had Kaal Sarp Yoga and lived a kind of miserable life , these are Pt. Jawahar Lal Nehru, Sachin Tendulkar, Dhirubhai Ambani, Rajnikanth and many more. Now, let's understand what it is actually? So, we have 9 planets in a horoscope, in Indian Vedic Astrology. When all other 7 planets are placed in between Rahu and Ketu in a horoscope, then it is called as Kaal Sarp Yoga. Like in the picture attached, Ketu is in the 4th house and Rahu is in the 10th house and all other 7 planets are placed in between Rahu and Ketu (within 10th house to 4th house). If the same planets are placed within 4th house to 10th house, then also it would be Kaal Sarp Yoga. Why it was named Kaal Sarp Yoga? In some versions or branches of Astrology, Rahu is known as Dragon's head and Ketu is known as Dragon's tail. When all other planets get placed between Rahu and Ketu, in some people's view, it takes the shape of a snake or serpent, hence Kaal Sarp Yoga. And of course, it is a scary name , people will get scared easily. In my personal opinion, no special impact just because of this position of planets. Like, in this horoscope, Rahu will do its job in 10th house (i.e. making person obsessive about Career and Fame), Ketu will do its job in 4th house (i.e. isolating separating person from his home and homeland) and all other planets will work as per their positions. All I want to say that there is no special impact of Kaal Sarp Yoga. Now, another way to see this yoga. So, Kaal Sarp Yoga comes into existence when all other 7 planets are placed in between Rahu and Ketu. Just imagine that this horoscope is actually the current planetary position in sky. Now, when will this yoga break? When one of the planet will either cross Rahu or Ketu and go to other side of horoscope which is right now blank. Because then there will be only 6 planets left in between Rahu and Ketu and Kaal Sarp won't exist anymore, right? So, which can move fastest? Moon. Moon has speed of 2 days and 6 hours of moving into next house. 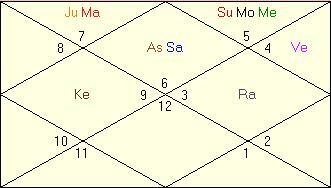 Moon is in 12th house and it moves direct, so to cross Ketu it needs to move through 5 houses. 1 house is 2 days and 6 hours, so 5 houses means about 11 days. So, if this is today's planetary position then for next 11 days Kaal Sarp Yoga is going to impact whomsoever takes birth in this world. Now, just think how many kids will take birth in world in next 11 days? Are they all going to be unfortunate and live a miserable life? I don't think so. Another thing is said that Kaal Sarp Yoga shows its impact in Rahu or Ketu's Mahadasha as these planets are forming this yoga. Well, then please look at Sachin Tendulkar's horoscope, who has Kaal Sarp Yoga and he played his best cricket in Rahu's Mahadasha. So, basically, this yoga in itself won't do any harm. Your horoscope as a whole stands.